Pigeons and doves constitute the bird family Columbidae. Although the terms Dove and Pigeon are somewhat vague, Pigeon is generally used to denote the domesticated member of the family. A Feral pigeon like the one you see in the photograph is a domestic pigeon that has returned to the wild and is abundant in towns and cities throughout much of the world. The Homing Pigeon is a variety of the domestic pigeon that has been selectively bred to find its way home over extremely long distances. 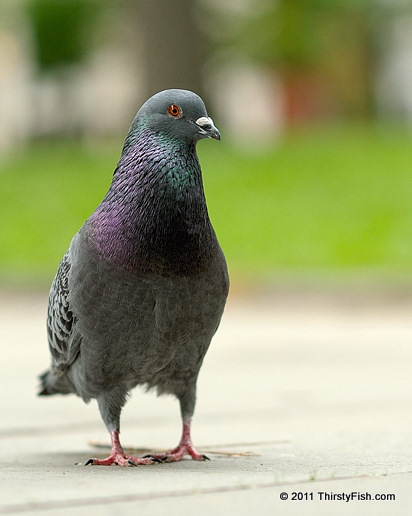 Most pigeons instinctively return to their own nests and mates, but scientists have yet to conclusively explain how pigeons navigate. Homing pigeons have been used as Carrier Pigeons to carry messages by numerous civilizations for thousands of years. Before the advent of wire and radio communications in the 19th and 20th Centuries, they were the fastest way to send written messages. Carrier pigeons can fly with average speeds of over 50mph for distances of hundreds of miles. One carrier pigeon named Cher Ami was a hero that helped save the lives of 194 survivors of the U.S. Lost Battalion of the 77th Division during World War I. With a note dispatched in a canister on his left leg, Cher Ami delivered his message, despite having been shot through the breast, blinded in one eye, covered in blood and with a leg hanging only by a tendon. Cher Ami was treated for his injuries and returned to America to a hero's welcome. After his death, he was mounted by a taxidermist and is currently on display at the National Museum of American History's "Price of Freedom" exhibit.